The heroes arrive but AMAZO has already begun his rampage. Will they be able to stop him before more lives are lost? The chapter opens with Batman & his allies arriving five minutes after AMAZOs arrival…which was already too late for 23,000 poor souls. Green Arrow is horrified at the loss of life but Batman tries to get everyone to not focus on the death for the time being. The Teen Titans (Superboy, Starfire, & Wonder Girl) then arrive and Batman gives out his orders. Green Arrow wants to help with AMAZO but is relegated to Evacuation Duty alongside Batgirl. Superboy leads the attack but is easily knocked aside. However, this gives Starfire, Wonder Girl, and Steel a chance to strike the Android. 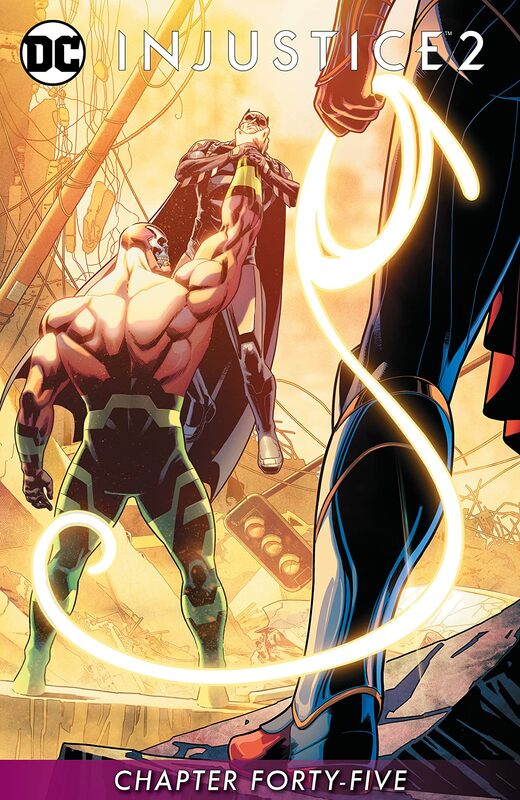 After AMAZO is grounded from their efforts, the three try to hold him down while Brother Eye scans for weaknesses. But Brother Eye apologizes and says AMAZO has no weaknesses. AMAZO throws Batman aside and turns his sights on the evacuees. Green Arrow uses his last resort and fires a mini-nuke arrow that seemingly blows off AMAZOs head. 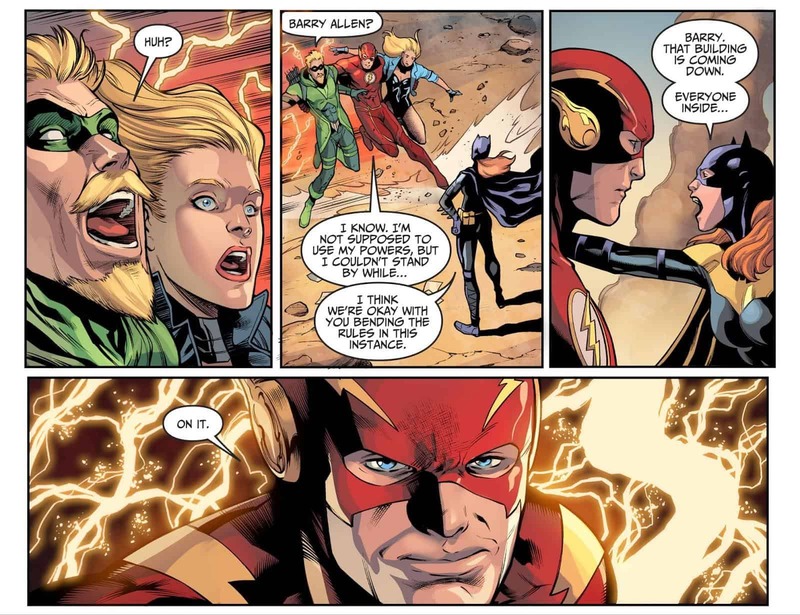 Harley & Black Canary humorously call him out on having such a weapon so casually but the moment ends when AMAZO reawakens and fires his laser vision and the quarreling couple. It turns out, Ollie & Dinah aren’t dead as Harley Quinn feared. The Flash has raced to their aid and saved them from incineration. This marks his first appearance since he stopped to help Galaxor rehabilitate back in Issue 32. He apologizes for using his powers to Batgirl but she gives him a pass and sends him to help evacuate people in a collapsing building. Flash, being the Flash, accomplishes this with ease. Meanwhile, Superboy continues his one-on-one battle with AMAZO but isn’t fairing so well. Batman comes to his aid and declares everything has a weakness. AMAZO terrifyingly repeats weakness multiple times as he tears Batman mech to pieces. Before Bruce can meet a similarly gruesome fate, a shield flies into AMAZOs head and distracts him. 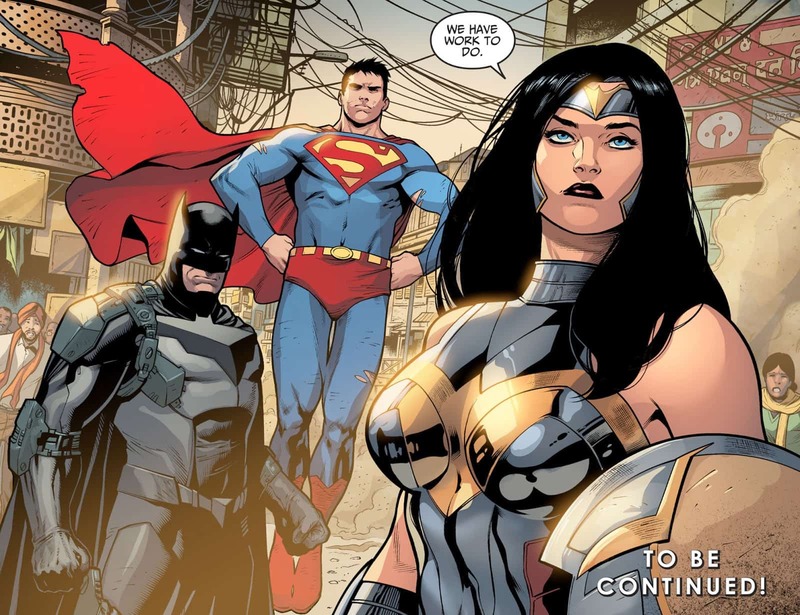 Wonder Woman has arrived to help take down AMAZO and the chapter ends with the image of a sort of new Trinity. This was just an overall great chapter. The action, dialogue, and art were all in top form. Only three people didn’t get anything of note but given who they were, it made sense they wouldn’t appear beyond the entrance scene. 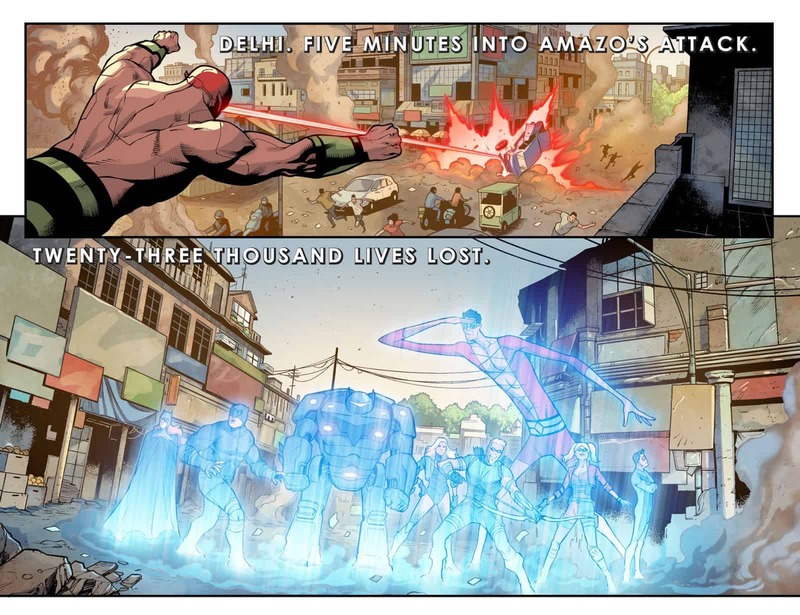 AMAZO continues to get amazing and terrifying visualization. You could tell the fear Batman felt was real moments before AMAZO was stopped. The return of the Flash was honestly unexpected. Seeing Superboy in the original Superman suit (especially on the final page) and Flash saving people from a collapsing building was just nostalgic greatness. It was a nice chapter of seeing the heroes just be heroes to the public at large. No secret political messages, no hero-on-hero in-fighting, no excessive drama, just classical heroism. I do love how Injustice 2 has handled the dark timeline, but seeing this return to classical form shows a nice level of growth for the world itself. Instead of being trapped in a vortex of darkness they’re getting a reminder of what was and could be again. Final Thought: This was an awesome chapter I’d recommend to others, especially if they have been consistent with the Injustice comics as a whole. When you take everything that happened into context, the last page with the Trinity (at least pseudo Trinity with Superboy being there in place of Superman) was something they never did before now and seemed like something you’d never see. I am super excited for the next chapter and can’t wait to see what they do.